The study of pranayama, the breathing techniques unique and integral to yoga, is essential for teaching this ancient system of well-being to students of all ages and all levels. As yoga teachers, we place high value on these breath techniques, which improve the overall health and function of the body’s vital organs and every one of its 100 trillion cells. 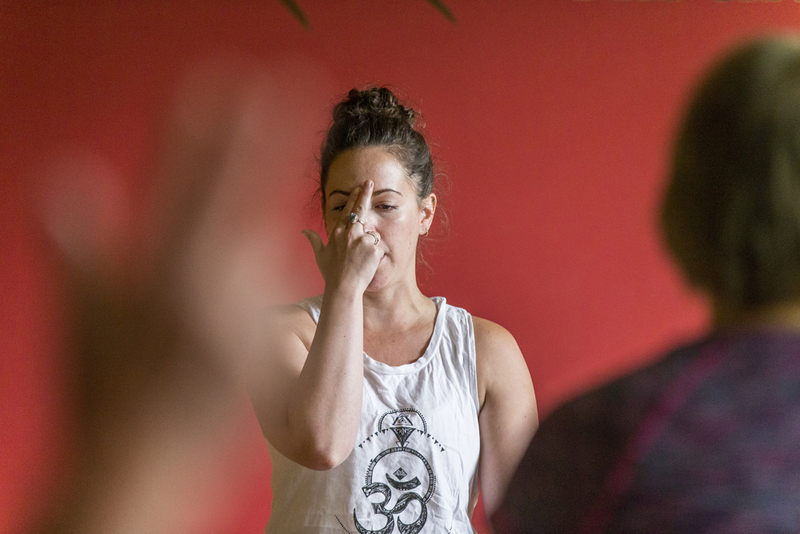 Led by Gwen Linden-Bruzek, a skilled and deeply committed teacher of pranayama, this 20-hour intensive study teaches the powerful healing ways of the breath, the first pose of yoga. Green Lotus' weekend breath intensive offers a rare opportunity to enhance your skills in this new way: Not only will you learn and practice simple to complex techniques, but you also will gain insight into how to develop sequenced pranayama practices to offer to your students, patients, and clients. This point-of-view, to learn the individual breathing techniques and how to string them together in different sequences to offer group or individual sessions, will enhance your skills and help you to deliver well-being in more ways and settings. Breathing techniques calm the nervous system and the mind. They help tame anxiety and depression. They ease women through child-birth. They aid those who are actively dying and the friends and family offering support to the dying. They make it easier for us to practice asana – the poses of yoga – and other forms of exercise, from hiking to dance to golf to horseback-riding. And so much more. Whether you teach yoga, are a psychotherapist, a fitness trainer, a midwife, a coach, minister, physician, nurse, or a physical therapist – or simply want to deepen your personal understanding and practice of yoga and the role of breath in it – you will benefit from this training. Please bring a notebook or journal to capture notes, questions, and observations. There is no required text for this training, study materials will be provided. Because our training sessions frequently develop a wait list, refunds will be made to your personal Green Lotus account with less than two weeks' advance notice when you cancel. Cancellations made with less than a 48-hour notice will not receive a refund.